This is it. The battle to end all battles. The most February title-decider ever played. The Game of Thrones. King Kong. Star Wars. Ummmm, Goldfinger... Toy Story... I forgot the question quite a while back, who are you again? Anyway, there will be 12 matches remaining in the Premier League season when this weekend is over and Arsenal could find themselves anywhere between two and eight points back of Leicester City. I guess that's why they call these six-pointers, since that's exactly why they call these six-pointers. Since Arsenal still have to play away fixtures against Manchester City, Manchester United, and Tottenham Hotspur (not to mention West Ham and Everton, which aren't exactly easy, either) it's really hard to see them coming back from an eight-point deficit. But a two-point gap with 36 points still on the table? That's not bad at all. It's hard to say any match in the middle of February is must-win, but this is probably as close as it gets. Well, he looks pretty fast here. There are no changes to the available squad from last week to this week; Tomas Rosicky remains out with his new injury, Jack Wilshere and Santi Cazorla are both back running, so it's a question of weeks and not months for them, and Danny Welbeck is not yet match fit but could be a possibility for Hull in the FA Cup next week. That means the real questions lie in player selection. 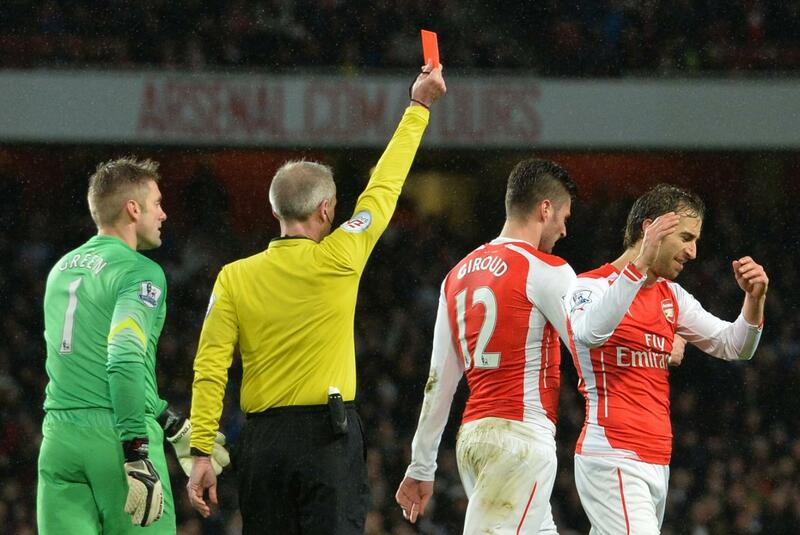 Per Mertesacker has been dropped since his red card against Chelsea. Even though he is the most experienced option at center back, his lack of speed would be suicidal against Leicester's counterattack. If Arsenal intend to win this game, Gabriel has to retain his place. In the center of midfield, I certainly hope Francis Coquelin is ready to return to the XI, with Mathieu Flamini, he of the unnecessary lunging slide, dropping to the bench. The other question would be on the right wing, where I'm guessing Theo Walcott will start, though it could also be Alex Oxlade-Chamberlain or Joel Campbell. Theo just seems the most likely choice to me, even if he frustrates me to no end. Predicted XI: Cech, Bellerin, Koscielny, Gabriel, Monreal, Coquelin, Ramsey, Alexis, Walcott, Ozil, Giroud. Leicester City will be without Jeffrey Schlupp, out until the end of the month with a hamstring injury. Matthew James has been out since May with an ACL injury; he's off crutches now, but is not ready to come back. Elsewhere, Daniel Amartey lacks match fitness. This all means that Leicester should be unchanged from the XI that ripped Manchester City apart at the Etihad last weekend. The Foxes are, of course, led up top by Jamie Vardy and Shinji Okazaki, who tends to play more of a support role. Riyad Mahrez is the creative man on the right wing, while Danny Drinkwater and N'Golo Kante have been tenacious at winning the ball in midfield this year. On the backline, Wes Morgan and Robert Huth are moderately immobile, which means they need support from Drinkwater and Kante as a shield; it also adds further reason for Arsenal to start Theo Walcott on the wing. The fullbacks tend to play narrow, providing even more support for those big center backs. Predicted XI: Schmeichel, Simpson, Morgan, Huth, Fuchs, Drinkwater, Albrighton, Kante, Mahrez, Vardy, Okazaki. Mesut Ozil's goal celebration remains pretty creepy. So, where are we now? Arsenal had gone three league matches without a goal before scoring twice in 88 seconds at the Vitality Stadium last Sunday, in a 2-0 win over Bournemouth. 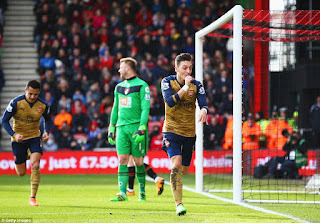 It was Arsenal's first win in the league since January 2, snapping a four match winless run. With all of that said, Arsenal's 1-0 loss to Chelsea is their only loss since Boxing Day. The problem is those pesky draws. Since the 4-0 loss at Southampton on Boxing Day, Arsenal have five wins (two in the FA Cup,) one loss, and three draws. That's why they've gone from two points clear after match number 20 to five points back of Leicester after match number 25. Over those five matches, Arsenal have dropped nine points, while Leicester dropped just two (and they were to Aston Villa!?) Going into the second half of the season, my initial expectation was that teams would not be as surprised by Leicester as they were the first time around. However, they've beaten Tottenham, Liverpool, and Manchester City in the past month, putting paid to that theory. After their trip to the Emirates this weekend, Leicester will have only one road fixture remaining against a team in the current top nine; that's a trip to Old Trafford the final weekend in April. In total, they've only lost twice in the league all season: to Arsenal in September and at Anfield on Boxing Day. Arsenal handed Leicester their first loss of the season on September 29, as the Gunners won 5-2 at the King Power Stadium; Leicester have lost just once in the league since then. Jamie Vardy opened the scoring on a textbook Leicester counterattack on 13 minutes, but Theo Walcott equalized for the visitors just five minutes later. Alexis Sanchez then took over; the Chilean, who had not scored for Arsenal up to that point in the season, netted a hat trick to put Arsenal up 4-1. Vardy picked up a brace to pull a goal back on 89 minutes, but Olivier Giroud restored Arsenal's three goal lead three minutes into injury time. This fixture last season took place around the same time of year (February 10, in fact); Arsenal took a 2-0 lead through Laurent Koscielny and Theo Walcott. However, Andrej Kramaric pulled a goal back for the Foxes just after the hour mark, leading to what felt like a 30-minute siege on the Arsenal goal. 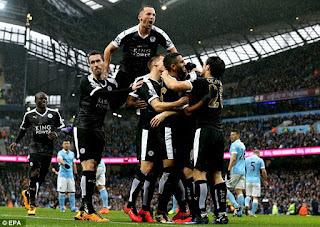 At the time, Leicester City was five points from safety, bolted to the bottom of the Premier League table; over the final 13 matches that followed, Leicester picked up an astonishing 24 points, winning seven of their last nine. 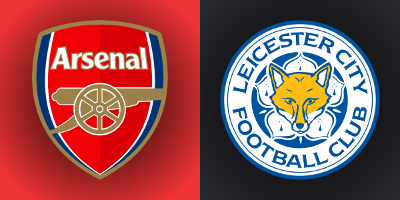 Leicester have not beaten Arsenal in their last 20 tries, dating back to a 2-1 win on November 23, 1994. The Foxes did, however, advance past Arsenal via a penalty shootout in the 2000 FA Cup fourth round, after consecutive 0-0 draws. Arsenal are unbeaten in their last 22 home matches against Leicester, across all competitions. The Foxes' last win in the red part of North London came on September 8, 1973 by a 2-0 scoreline. Leicester have won only six of the 59 league matches played between these two sides in London. might think head-butting is legal. The referee is West Yorkshire-based Martin Atkinson. Arsenal have lost five of their last nine with Atkinson in the middle, winning only against QPR last Boxing Day (in which Olivier Giroud was, correctly, sent off), Reading in last year's FA Cup Semi-Final (which required extra time, so over 90 minutes, it was a draw), and Sunderland in this year's FA Cup Third Round. Prior to the win over Sunderland, Atkinson also took charge of Arsenal's opening day loss to West Ham and their 1-1 draw with Spurs in November. Leicester City have seen Atkinson twice this season, but they haven't won either of those matches. Atkinson was the man in the middle for the Foxes come from behind 1-1 draw with Spurs (just as he was for Arsenal!) He also worked Leicester's 1-0 loss at Anfield on Boxing Day. Atkinson, who will be one of two England referees to represent the nation at the Euros this summer (the other being Mark Clattenburg), is the only Select Group referee yet to show a red card this season. Last season, he showed the joint most, with 10. John Painting is a contributing writer to the Modern Gooner and a gravitational wave. You can follow him on Twitter @zorrocat for inane sports commentary.